The One-Man Yank Invasion of Japan's "Kamikaze Island"
HOME > American > Men's Adventure Magazines > The One-Man Yank Invasion of Japan's "Kamikaze Island"
This fantastic story is set in the actual battle for Motobu Peninsula in Okinawa, which took place between April 9 and 20, 1945, during the Battle of Okinawa. US Marines took 12 days to capture the peninsula and suffered many casualties due to well-entrenched Japanese opposition. Some key aspects of this story, such as a Japanese Navy amphibious force with several ships off the coast of Okinawa and a storage area for ohka rocket-powered glider bombs on a small island with no airfield, have no basis in the history. The rocket boat contraption cobbled together by the downed pilot in the story could never have been put together by one man on a small island teeming with Japanese troops. The magazine story includes three photographs, one supposedly an aerial view of Yagachi (usually written as Yagaji) Island where the pilot's plane crashed and two others of Marine divisions occupying Motobu Peninsula. Sheathed in clouds of flak, screened by the Imperial Navy's toughest "Dragonfly" ships, this off-shore suicide plane fortress was like a poison spear in the side of the U.S. force struggling to conquer Okinawa. Then a jaguar-fierce pilot named Hendel fought his way in, using a strange "pontoon bomb" to boil 500 Japs in their own TNT death brew . . .
On April 14, 1945 two battalions of the 4th Marines—the 1st and 2nd—joined with units of the 29th Marines on Okinawa for a final assault on Okinawa's Motobu Peninsula. A jutting finger of land jammed with fanatic Japanese, it extended westward from the mainland. For two weeks, ever since L-Day on April 1, Nipponese soldiers, marines and civilian conscripts had held the American invaders at bay. Now, with rumors of impending Kamikaze attacks by the famed Captain Okamura  and his Ohka piloted missiles, the enemy had to be wiped out fast. An officers' briefing by Colonel Arthur Dunn, commander of the U.S. force on the peninsula, made the importance of the assault crystal clear. "It's a gamble," he said, "but one we have to take. We'll be on our own—no supporting units to spare. "All right. In one hour we move out. Let's make it good and fast—before those Ohka pilots have a chance to go to work. Unless we clean the remaining Japs off this sandspot soon, we might become the besieged instead of them." The colonel walked quickly toward the entrance of his headquarters tent but before he could get into his waiting jeep, a signalman called to him: "Message from Two Battalion." The men standing near could barely see the officer's face in the early dawn light but they had no trouble hearing his shocked cry as he read the message. "My God, a Japanese amphibious force is preparing to land behind us! Their ships are approaching the north end of the Peninsula neck! " For a long moment he looked at the piece of paper in his hand as though he couldn't believe the words on it. Then he leaped into his jeep and yelled to the driver, "Take me to the breach. I want to see them with my own eyes." The colonel and his companions had little trouble spotting the enemy force as it eased slowly towards Motobu Peninsula. "Damn . . . damn . . . damn . . . those yellow bastards have us trapped," he whispered. "We'll be stuck between two Jap forces." "Shall I countermand the attack order, Colonel?" a captain asked. "Negative. We might just as well die fighting." "What the hell is all that smoke out there?" another officer cried, pointing toward a small offshore island. Black clouds billowed skyward directly behind the oncoming enemy vessels. The colonel could see flames on the island which was approximately three miles away. Before he could even conjecture as to the cause of the blaze, a sergeant yelled, "Man, look at that thing go." Dunn swung his eyes in the direction the sergeant was indicating. His jaw dropped in surprise. At first, because of the wings, he thought it was an airplane skimming the water but since the vehicle left a distinct wake, it was obviously moving on the sea, not above it. As it came closer he saw small pontoons hanging from the tips of the wings. It had a long nose, a twin-rudder tail like a miniature B-24 bomber and a glass-enclosed cockpit. Every second or so a ball of smoke escaped from the rear of the strange craft, and it would spurt ahead at tremendous speed. "I don't know what it is," the colonel said, "but I can see somebody in the cockpit." Keeping his binoculars trained on the craft as it raced towards the enemy fleet, Dunn watched in amazement as the intervening distance dwindled to only a few yards. "Whoever that guy is, he's sure asking for trouble," the sergeant muttered. "He's getting might close to those Jap boats." "He's going to ram the command ship," the colonel said, his voice filled with awe. "At least, he's trying to. But look at that barrage those Nips are throwing at him!" "He'll never make it," the sergeant muttered. "Never." Knowing that their lives depended upon the stranger in the weird seagoing craft, the Marines watched breathlessly. Some swore as the enemy fire increased, kicking up geysers of water all around the vehicle. Finally the colonel dropped his binoculars from his eyes and shook his head. "No one could get through the solid screen of firepower," he said resignedly. At the same moment that the colonel was making his doleful prediction, the "guy" in the strange vehicle—Lieutenant Frank Hendel—was also beginning to have doubts about his one-man onslaught on the Japanese amphibious fleet. He had known that it was a bad gamble from the beginning but he hadn't known that the payoff was going to be a thunderous barrage of gunfire heavy enough to sink a battleship. The Yank swore softly and wished he was back on the tiny island he had left just a few minutes earlier, the island which had been his hiding place for a week and half. On April 3 Lieutenant Hendel, a Navy pilot flying a Grumman fighter, had been detailed to strafe Japanese defense sites on the northern perimeter of Motobu Peninsula. With 10 other pilots he had carefully circled away from the anti-aircraft guns on Ie Shima, banked south, and came into the enemy area in a screaming dive from 10,000 feet. On the first pass over the Jap installations—half-hidden in the mountainous, inhospitable terrain — he had blasted two machine gun nests but missed an artillery emplacement, seeing it too late to fire. As he climbed back over the water, he saw his comrades heading west toward other targets. "Green Flight Leader, this is Green Three," he said into his radio. "I'm going to make another pass over previous area. Artillery concentration there." After clearing himself several times to make certain that no enemy fighters had eased on to his tail, Hendel pushed the control stick forward and nosed his plane straight down. The Yank kept the needle on the air-speed dial pushing the red mark all the way down. He could feel the Grumman start to vibrate, felt the rudders kicking his feet as the terrific airstream smashed against the tail section. He fought a tendency of the aircraft to "buckle under"—flip on its back. At 1,000 feet he released his bomb and thumbed the gun button at the same instant. Holding the target in his ground-glass sight until the last fraction of a second, he blasted the scurrying Japs to pieces. Hendel, in his eagerness to destroy the gun site, had made two mistakes. He had delayed his pull-out a second too long and he had neglected to check for enemy fighters once he had started his attack. As the blood started to drain from his head and the blackness of too many "G's" blurred his vision, he took one last look at the onrushing ground. "C'mon, baby, get your nose on course or we're not going to make it." Half-unconscious from the too-abrupt pullout, the Yank hung onto the control stick with a death grip while the shadows of trees, hills and protruding artillery gun barrels flashed past. Suddenly there was a loud thump and he felt the Grumman bounce skyward. A moment later his eyes began to clear and he discovered that his plane was shooting straight up at full speed. Caught in the wing roots were branches, an indication of what had caused the thump and bouncing of the fighter. "Whew! That was close," he gasped. "I've never . . ."
The lieutenant didn't have time for any more words. A Zero had cut directly in front of Hendel's Grumman. It had evidently followed him down when he made his attack on the gun site and now the pilot was also trying to pull out of his dive. The Jap flyer was still groggy from the heavy "G's." The Yank never had a chance. With his fighter cutting through the sky at full speed, he rammed directly into the Zero's wingtip, throwing debris in all directions. The enemy plane immediately flipped over on its back, exploded when gasoline from a ruptured fuel tank hit the hot engine. The Grumman seemed to stop in mid-air then lazily fall back on its tail, tumbling end-over-end towards the water below. The Yank kicked the rudders and discovering that they flopped loosely, a sure indication that the control cables had snapped. He threw open the canopy, unfastened his safety belt and let the plane throw him out. He only had time to swing twice at the end of the shroud cords before he hit the ground with teeth-rattling impact. The sudden crash onto solid earth surprised him, since he thought he was over water. Still dazed, he slipped out of his parachute harness and, making certain his .45 automatic was still in his shoulder holster, ran as fast as he could from the area, stumbling at last on a cave. He fell immediately asleep inside. It was dark when he awoke. Unable to determine his location, he ate part of his emergency rations, scooped up some water from a depression in the ground and wet his lips, then fell asleep again. At dawn he was awakened by the sound of low-flying planes. He quickly crawled back to the entrance of the cave and looked out. "Well, I'll be damned!" he exclaimed. Instead of being on Okinawa proper, Hendel discovered that his hiding place was a small off-shore island about three miles north of Motobu Peninsula . The planes he had heard were American Navy craft heading for another raid on the main island. Thinking that he might be able to signal for help, the Yank climbed out of the cave and hurried toward a small knoll. He had gone only a few steps, however, when he spotted a group of buildings. Right in the middle of them was a pole with a Jap flag atop it. He waited until nightfall before he investigated further. It didn't take him long to learn that the Japanese were using the small island as a storage depot for their troops on Okinawa. Food, ammunition, guns, bombs — all the necessities for a long, drawn-out battle were piled high in the area. As Hendel slipped around the upper side of the area, intending to try and get back to his cave, he saw a large canvas cover concealing a huge pile. "Wonder what that is?" he muttered. "Must be important since it's the only covered heap in the depot." Moving closer, he lifted one end of the canvas and looked under it. Baka's! Japanese suicide planes! He thought with chilled alarm. Back at his cave the sight of the Ohkas, as the Japs called the "Baka's," he thought that the ammunition, the fuel, the bombs, and the guns together did not pose the threat that these suicide planes did. Tiny rocket-powered craft with warheads in their noses, they were little more than missiles with a human detonator aboard. Since they had no landing gear, the weird ships had to be launched from a larger "mother plane." Hendel and his comrades had been briefed thoroughly about the special unit, The Corps of the Divine Wind, which the enemy had organized to wipe out American invaders. Captain Okamura, the commander of the unit, was convinced that his volunteer death pilots could annihilate troops on shore and American ships at sea. Okinawa was to be the crucial test of his theory. Not only were Baka's on board the Japanese carriers in the area but hundreds of them had been transported to Okinawa prior to the invasion . "This must be the shipment we were warned about," Hendel said to himself. "These Japs mean business. Once they launch these kamikazes against us, it will be slaughter." For three days, he racked his brain for some way to get off the island. Every time he ventured from the cave in daylight, he spotted Japanese sentries patrolling the area. On the morning of the fourth day, desperate and weary, Hendel slipped from his cave and started north, giving the main enemy depot site a wide berth. He was determined to scout the entire island, to find an escape route if at all possible. For the first hour he saw only deserted countryside but just before noon, he stumbled onto a clearing on the opposite side of the island from his cave. He soon discovered that the clearing had been cut by a crash-landing Rufe floatplane. The enemy pilot had desperately tried to reach the water but had hit land a few hundred yards short, flipped over and crashed on its back. Then, when he was closer to the wrecked plane, Hendel got a jolting surprise. Held by clamps to the belly of the turned-turtle seaplane was an intact, unpiloted suicide plane . The chances were that the dead pilot had been testing the Rufe's capabilities as a Baka "mother ship" when the accident occurred. The Yank, after making certain that there were no enemy soldiers in the desolate area, slipped over to the wreck and examined it closely. The small, single-seated wooden Baka, which looked like a cross between a boat, an airplane and a guided missile, still had its warhead in the nose. The lieutenant looked at the suicide plane for a long time. "The fuselage is smooth and rounded like a boat bottom. Now if I could . . ." He turned his attention to the wrecked floatplane. The aircraft's wing pontoons were undamaged. "If I could get these pontoons onto the wings of that Baka I might have myself the fastest damn boat in the Pacific." He looked at the plane wreckage, turned and looked at the Baka—attached to its belly—and made up his mind. "It's worth a try." For the next week the daring Yank made nightly trips to the clearing and worked on his strange vehicle. During a violent rainstorm on the tenth night of his stay on the island, he made a foray to the enemy depot, stealing food and tools. This haul gave him the supplies he needed while he worked desperately to complete his unorthodox project. At the same time Hendel was struggling alone on the off-shore island, the 29th Marines made plans for their all-out attack on Motobu Peninsula. The Japanese, adhering to what they termed the "Okinawa Defense Plan," were using a tactic that the Americans had never faced previously. Based on the proximity of Japan proper and the destructive power of the newly developed kamikaze weapons, Admiral Ota had decided not to scatter his forces in an attempt to defend the extensive coast line. Instead he concentrated his men in elaborately prepared positions on the best defensive terrain and waited for the invaders to come to him. He hoped that they would be sucked inland and then stranded as the kamikazes destroyed their supporting ships and Japanese amphibious forces landed behind him. On Motobu Peninsula the plan was working to perfection. Colonel Udo and the Second Infantry Unit had baited the Americans out onto the isthmus until they were completely separated from other Allied units on the mainland. Now the secret amphibious assault at the neck of the Peninsula would put Japanese forces behind the 29th Marines and the kamikaze pilots in their Bakas would move in and finish the job. It was a perfect setup. Perfect, that is, except for one unknown factor—Lieutenant Frank Hendel. The lieutenant, after an ingenious rebuilding job that would have enhanced the prestige of the best Navy mechanic in the Pacific, finally completed his work on the evening of April 15. "Tomorrow as soon as it gets light enough for me to see, I'm going to launch that damn Baka and see what happens," he vowed. "I have to get back to Okinawa and warn the brass about this storage depot." Two hours before dawn he headed for the clearing in the north. With a makeshift block-and-tackle he pulled the Baka to the water's edge while it was still dark. He wanted to be able to hit the rocket ignition switch as soon as it was light. The minutes passed interminably but finally streaks of light pierced the dark sky and Hendel knew it was time. He climbed into the snug cockpit, strapped himself tight, and rested his hand on the rocket ignition switch. "Now if this baby doesn't blow up before it starts moving, I ought to be in Okinawa before these Japs can blink their eyes. These rockets should . . . ."
He stopped muttering and stared across the open sea towards the faint outline of Motobu Peninsula. "Ships? Hell, the Marines must be making another landing." But as the sky got lighter the Yank spotted the Japanese flags flying from the ships. "Those yellow devils are putting men behind the Marines, blocking them off from the mainland! They won't stand a chance of getting out alive—not after the Japs start using these Bakas." He sat in the cockpit of his improvised rocket boat and swore softly. "I can't warn them. No radio. There's not a damn thing I can do to help . . ." Suddenly he thought of the large store of Bakas on the island. Maybe he could destroy them before he left. He looked out across the water towards Okinawa. He hated to forego his chance of escape. Hesitating, he sat lost in thought for a moment. Then, with a curse, he unfastened his safety belt and climbed out of the modified Baka boat. "I can't leave those guys to die without at least trying to help," he murmured. Cautiously he circled to the south of the storage area until he reached a point just opposite the huge store of Bakas. While he could see no guards directly at the suicide plane depot, there were several Japanese soldiers working a few hundred feet away. He picked out one Baka, and wormed his way toward it on his stomach. He moved a few yards then stopped and waited to see if he had been spotted. Once a group of enemy workers carrying a Baka warhead passed within 10 feet of him. It took him half an hour to cover the distance. Finally, when he was within 10 feet of the Baka, the tall grass stopped. Waiting until the enemy soldiers were busy, he leaped to his feet and raced to the Baka. Throwing back the canopy, he reached in and fumbled for the rocket ignition switch. His fingers had just touched it when he heard a loud shout. A moment later a rifle bullet thudded into the ground a foot from where he was standing. 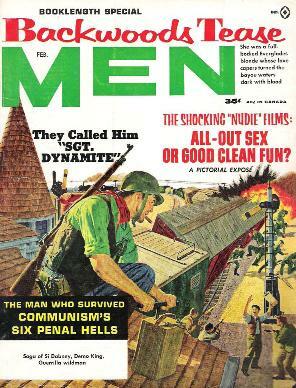 "Go, baby, go," he cried, flipping the switch to the on position. "Go . . . go . . . go . . ."
For a moment nothing happened. The soldiers were firing at him from all angles now as he raced back for the cover of the tall grass. The Yank knew he'd never make it alive. He couldn't dodge all the bullets any more than he could run between the rain drops of a thunder storm. A blast knocked him forward and he hit the earth face first. At first he thought a rifleman had zeroed in on him but as the explosions continued in a steady stream, he spit the dirt from his mouth, cleared his eyes, and looked back. A grin spread across his face. The Baka he had started had finally been forced ahead by the five rockets . It had smashed into the huge main store of suicide planes. Its warhead had exploded, starting a chain reaction of blasts. While the shocked and wounded Jap soldiers milled around in confusion, Hendel raced back to the clearing and climbed into the Baka he had converted into a crude boat. Quickly he fastened his safety belt as tightly as possible, locked the canopy shut and reached for the rocket ignition switch. "Here goes nothing," he yelled, flipping the switch to the "on" position . . . The Yank was thrown back hard against the cockpit seat when the five rockets fired. If he hadn't secured a firm grip on a bracing handle, he would have probably been knocked unconscious. For a moment the Baka teetered at the edge of the water, threatening to twist sideways as the rockets fired one by one, giving an uneven thrust. If it did swerve, Hendel knew that one of the pontoons would be ripped away and his escape stymied. "C'mon, let's get started!" he shouted. "Let's head for . . ."
A rifle bullet thudded into the Baka less than a foot ahead of the cockpit. More slugs followed, peppering the top of the wooden fuselage and smacking into the ground on all sides. The lieutenant turned and stared back towards the mountains. About 30 Japanese soldiers had followed him from the storage depot. "Go, dammit, go," Hendel screamed at the stubborn Baka. 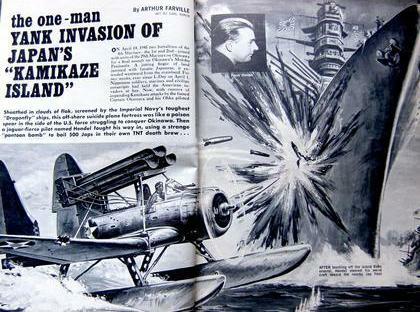 As though hearing his command, the Japanese suicide plane, now a modified rocket boat, leaped toward the water. The heavy warhead in the nose dragged the front of the Baka under the surface and the Yank swore. "Hell, it's going to sink!" Afraid of being dragged under, he unfastened his canopy, started getting out. But as the rockets in the rear developed their full power, the nose of the Baka popped out of the water like that of a surfacing submarine and the next moment the strange craft was skimming across the water toward distant Okinawa at full speed. Experimenting with the control stick, Hendel discovered he had perfect control of the vehicle. His plan for escape was simple. He intended to stay north of the Japanese amphibious fleet and slip into the harbor east of Yagachi Shima, knowing that this section of Okinawa was under American control. Alternately slowing down and spurting ahead as he gave it thrust from the rockets, the Baka raced across the water toward Yagachi Shima as though it had been designed for sea travel instead of aerial warfare. But as he neared the enemy amphibious fleet and saw the command ship with the Japanese admiral's flag waving from it, a change swept over the Yank. He suddenly forgot about his own safety, about his determination to reach Okinawa where he could get help. He kept the Baka on course for Okinawa but his eyes stayed on the command ship from which he knew the directing orders for the behind-the-lines landing were being given by the Japanese officers. "If I could disrupt the communications. If I could sink that command ship . . ."
He forced himself to ignore the fleet, to look straight ahead toward the spot where he wanted to beach the Baka. But like a super-strength magnet that could not be resisted, the enemy vessels attracted his attention again. By this time he was close enough to the neck of Motobu Peninsula that he could see a few Marines on the beach. They were digging in, watching the Japs prepare to land. The sight of the trapped men waiting to die was too much for him. "Okay, you stupid squarehead of a pilot. If you don't have sense enough to save your own skin at least do some good with it." The Yank banked the speeding Baka sharply to the right and headed for the Japanese command ship. "If this warhead is any good I ought to be able to blow part of that ship clear back to Japan," he muttered. For the first 500 yards of his run on the ship he went unnoticed. Hey, this is going to be easy, he thought. But suddenly, as he got within firing range of the fleet, every gun aboard ship belched orange fire and miniature geysers rose all around the Baka. A moment later a near hit lifted the right pontoon attached to the stubby wing of the Baka, forcing the left pontoon to dig into the water too deeply. The suicide vehicle swerved sharply left, tilting so high that Hendel's head smacked hard against the side of the canopy. Quickly the dazed pilot threw the control stick hard right but the Baka didn't respond. Desperate, he hauled back on the stick. For a fraction of a second nothing happened, then with a sudden jerk the rocket boat tried to fly. Since it wasn't designed for ground or water takeoffs, it couldn't lift off the sea but it did nose up far enough to get the pontoon out of the water. Angrily he swung back toward the command boat. "All right, damn you, let's see you stop me this time." Roaring at full speed straight for the ship, after splashing all over the Baka from the heavy, concentrated gunfire, the white puffs of smoke trailing behind as he hit the rocket selector switch, the lieutenant drove directly into the fleet. He whizzed past landing barges and troop transports. He waited until he was within 50 feet of the command ship before firing the small bazooka-like wing rockets. They blasted into the ship's side, obviously doing little damage. Now it was up to the main warhead in the Baka's nose . . .
Hendel opened the canopy and prepared to leap from the suicide craft. He had just unfastened his belt and was struggling to his feet in the tight-fitting cockpit when a shell burst to the left of the Baka. A hunk of shrapnel buried itself in his shoulder. The force of the steel fragment knocked him back down into his seat dazed. His shoulder and arm felt as though a burning torch was cutting through it and a pool of blood quickly formed on the floor of the Baka. Ahead of him, through pain-blurred eyes, he saw the command ship almost within arm's length . "Gotta get out of here. Gotta get out," he cried. But the shrapnel had slammed him down so hard that he was wedged tightly in the cockpit, his left foot caught underneath the rudder pedal. Squirming, pulling, jerking, he finally yanked the foot free. Grabbing the bracing handle he pulled himself erect. He was dizzy now from the shock of his wound and the loss of blood and as he stood upright in the speeding Baka he weaved to and fro. Suddenly he lost his balance and, after nearly falling back into the cockpit, tumbled overboard. It wasn't a second too soon. With a thunderous blast, the Baka's warhead buried itself in the hull of the Japanese command ship. The ship raised from the water as the explosives let go. The bow and stern dropped as the vessel split in half, throwing men and officers into the sea. Flames quickly spread over the wreckage. An ammunition ship nearby caught on fire and as its contents exploded, the entire area became a maelstrom of explosions, flaming debris, whistling bullets, and the screams of dying men. Hendel, barely conscious, struggled onto a large piece of deck which had been hurled from the command ship. He stretched out, oblivious to the death and excitement surrounding him. Meanwhile, the enemy landing force, confused and disorganized by the sudden loss of their command ship and the officers directing the operation, milled in a wide circle. Finally, the ships separated and headed away from Motobu Peninsula, every vessel for itself. The threat of a behind-the-lines amphibious landing was ended once and for all. Lieutenant Frank Hendel was picked up the following day by a PT boat. More dead than alive, the Yank was rushed to Okinawa and then flown to a hospital on Guam, where he stayed for three weeks. When he was well enough to tell his story, high ranking officers were skeptical. Then, the eyewitness account of Marine Colonel Dunn and his men, who had watched the suicide attack from the beach of the Motobu Peninsula, verified the incredible incident. Later, an official citation stated: "Two incidents saved our forces from the Bakas. The sinking of the aircraft carrier Shinano with 50 of the suicide planes aboard by the submarine Archerfish  and the destruction of the large store of Bakas on an off-shore island by Lieutenant Hendel. The lives of those saved by his daring action will be a lasting memorial to this man." 1. Captain Motoharu Okamura vigorously promoted kamikaze attacks and became commander of the 721st Air Group (also known as Jinrai Butai or Thunder Gods Corps) that launched ohka attacks (Naito 1989, 9). However, it is very unlikely that anyone in the American forces on Okinawa had heard of his name. 2. The Japanese Navy had no such amphibious force to attack Okinawa at the time of this story. The Navy's last major action with ships was the suicide mission of the battleship Yamato along with escorts of one light cruiser and eight destroyers on April 7, 1945, but these ships were stopped long before they got close to Okinawa. 3. The rocket boat shown in this drawing is not consistent with the story's description of the craft. 4. Yagaji is the name of the small island north of Motobu Peninsula. However, it only a few hundred yards, not three miles, north of Motobu Peninsula. 5. Only a few dozen ohka weapons, not hundreds of them, had been transported to Okinawa prior to the invasion (Naito 1989, 99). None of these were ever used, since the Betty bomber mother planes could no longer take off from Okinawa after the Allied invasion. It is inconceivable that the Japanese Navy would have stored numerous ohka weapons on a very small island that did not even have an airfield. 6. in actual history, a Rufe seaplane was not used as a mother plane to carry an ohka weapon even in testing. 7. An ohka had only three rockets (Bungei Shunju 2005, 454, 582), not five as mentioned in the story. 8. If the pilot really were "almost within arm's length" of the ship when the powerful ohka bomb exploded, the pilot never would have survived. 9. On November 28, 1944, Archerfish launched four torpedoes that sank the aircraft carrier Shinano along with her cargo of 50 ohka weapons.